Hemopoietic commitment is initiated by and depends on activation of transcription factors. However, it is unclear whether activation of lineage-affiliated transcription factors is extrinsically regulated by to date unknown agents or is the result of a cell autonomous program. Here we show that signaling by the Notch1 transmembrane receptor instructively induces myeloid differentiation of multipotent hemopoietic progenitor cells and concomitantly up-regulates the expression of the transcription factor PU.1. 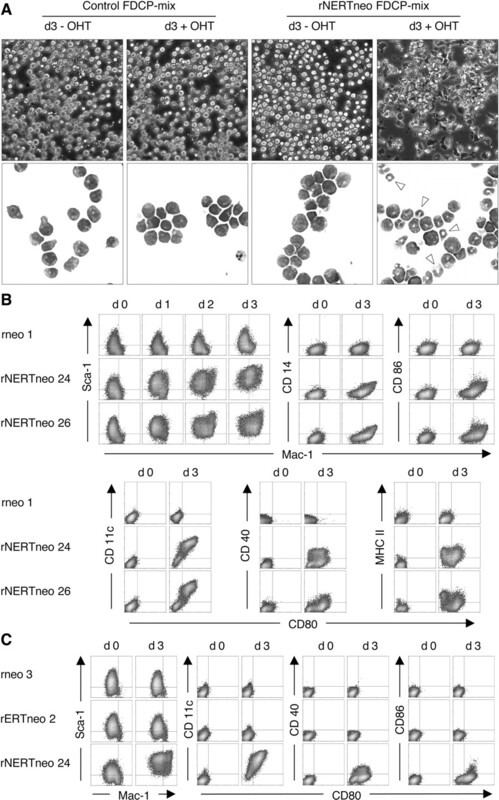 Transient activation of Notch1 signaling is sufficient to irreversibly reduce self-renewal of multipotent progenitor cells accompanied by increased and accelerated differentiation along the granulocyte, macrophage, and dendritic cell lineages. Activated Notch1 has no direct influence on apoptosis of multipotent progenitor cells, shows a weak inhibition of proliferation, and does not substitute for survival and proliferation signals provided by cytokines. Activated Notch1 directly increases PU.1 RNA levels, leading to a high concentration of PU.1 protein, which has been shown to direct myeloid differentiation. These findings identify Notch as an extrinsic regulator of myeloid commitment, and the lineage-affiliated transcription factor PU.1 as a specific direct target gene of Notch. Intercellular communication that controls the developmental fate of multipotent cells is mediated by the Notch family of transmembrane receptors in several invertebrate and vertebrate developmental systems (1). In mammals, four Notch receptors (Notch1–4) have been identified. Specific transmembrane ligands encoded by the Delta and Serrate/Jagged family activate Notch receptors on neighboring cells, inducing proteolytic liberation and nuclear translocation of the intracellular domain of Notch (NotchIC)3 (1). Nuclear NotchIC associates with the transcriptional repressor RBP-J, converting it from a repressor into an activator (2, 3). Through physical interactions with chromatin remodeling enzymes and components of the transcriptional machinery, NotchIC activates downstream target genes (4, 5). In vivo and in cell culture, NotchIC proteins function as ligand-independent, constitutively active proteins (6, 7). The classical view holds that Notch signaling keeps cells in an undifferentiated state (1). Recently, this idea has been challenged by observations that Notch can also play an active role in the differentiation of glial cells, keratinocytes, endothelial cells, thymocytes, and granulocytic progenitors (8, 9, 10, 11, 12, 13, 14, 15). However, the molecular mechanism(s) by which activated Notch instructs multipotent cells to differentiate along a particular lineage has not been established. Since Notch receptors and cognate ligands are expressed in hemopoietic tissues (16), it is likely that Notch receptors have a role to play in the regulation of blood cell production. Hemopoiesis is a continuous developmental process in which self-renewing, pluripotent stem cells give rise through a series of cell divisions to all specialized blood cells, e.g., to granulocytes, macrophages, dendritic cells, erythrocytes, megakaryocytes, and B and T lymphocytes. Survival, proliferation, self-renewal, and commitment to differentiation of hemopoietic stem cells occur in close association with cells of the bone marrow stroma. At present, however, it is still a question of debate whether multipotent hemopoietic cells are extrinsically directed to differentiate down a particular cellular pathway or whether the microenvironment only supports the survival and proliferation of cells that have intrinsically selected a specific hemopoietic lineage (17, 18). The development of mature cells involves fundamental changes in gene expression, resulting in the expression of a characteristic set of genes in each mature cell type. The tightly controlled patterns of gene expression are achieved through the action of transcriptional regulators with both general and restricted expression patterns in the hemopoietic system. A particular cell type will express a subset of transcription factors characteristic for the lineage, and these will positively regulate genes specifically expressed in this lineage. Thus, myeloid cells express, e.g., PU.1 and C/EBPs, which together with more generally expressed transcription factors AML1, Ets-1, and c-Myb, activate promoters specific for myeloid cells, such as the M-CSF receptor (M-CSF-R) (19). In uncommitted hemopoietic progenitors, lineage-affiliated transcription factors are coexpressed at low levels, and commitment to differentiation is reflected by high level activation of specific transcription factors and inactivation of others. Since to date no extrinsic agents have been described that control the expression of lineage-affiliated transcription factors such as PU.1, it was proposed that commitment is cell intrinsic and results from stochastic fluctuations in expression levels, which then establish a regulatory network through positive and negative feedback loops (20, 21). Notch1 mRNA and protein are found in immature, CD34-positive, hemopoietic progenitor cells; lymphoid, myeloid, and erythroid precursor cell populations; as well as peripheral blood T and B lymphocytes, monocytes, and neutrophils (16), suggesting an influence of Notch on differentiation and/or proliferation of multiple hemopoietic lineages and at various stages of maturation. However, while several studies indicate that Notch1 is critically involved in lymphoid development (22), the role for Notch signaling in regulating the differentiation of normal hemopoietic stem cells and early progenitors along the myeloid lineage remains unclear. Recently, we have shown that the effect of activated Notch1 is to promote differentiation of the granulocytic progenitor cell line 32D (8) rather than to block differentiation or maturation of 32D cells as suggested by earlier studies (23, 24, 25, 26). Ambivalent results were also found when primary hemopoietic progenitor cells were stimulated by the Notch receptor ligands Jagged and Delta; in some studies a moderate increase in colony formation was observed (27, 28, 29, 30), whereas others saw a decrease in colony formation (31), accelerated differentiation (32), or maturation (33). Studies aimed at unraveling the molecular controls that modulate the blood cell equilibrium are complex and require a pure population of progenitor cells that have retained a high capacity for both self-renewal and differentiation. The FDCP-mix cell lines represent a unique system for these studies. Established from murine long term bone marrow cultures, FDCP-mix cells have a normal karyotype, are nonleukemogenic, and possess many characteristics of very immature hemopoietic progenitor cells (34, 35). FDCP-mix cells exhibit an increased self-renewal capacity in vitro and therefore can be maintained indefinitely either on mouse stromal cells or in the presence of IL-3. They show a predominantly immature blast cell morphology, express cell surface markers characteristic of murine hemopoietic stem cells, i.e., CD34, Sca-1, and c-Kit, in the presence of high IL-3 and horse serum (self-renewal conditions), and differentiate in a multilineage response to physiological regulators for differentiation, such as stromal cells and hemopoietic cytokines (35, 36, 37, 38). Thus, we decided to use the FDCP-mix cell system to investigate whether and how Notch1 signaling influences cell lineage commitment, differentiation, proliferation, and survival of multipotent hemopoietic precursor cells. FDCP-mix cells were maintained in self-renewal culture medium consisting of IMDM supplemented with 20% pretested horse serum and mouse IL-3-conditioned medium equivalent to 100 U/ml recombinant mouse IL-3 (Roche, Mannheim, Germany) as previously described (36, 38). All experiments shown were conducted with rIL-3 (Roche). For activation of the 4-hydroxytamoxifen (OHT)-inducible intracellular domain of mouse Notch1(mN1IC; OHT-inducible mN1IC (NERT)) in FDCP-mix cells, OHT (Sigma-Aldrich, St. Louis, MO) was added to the medium at the concentrations indicated. Differentiation was induced by washing the cells once in IMDM and plating 1 × 105 cells/ml in IMDM containing 20% pretested FCS and the respective lineage-affiliated cytokines as previously described (37, 38, 39). Differentiation of FDCP-mix cells was monitored by morphological scoring of May-Grünwald-Giemsa-stained cytospins. All differential counts were made on 100–200 cells in a blinded fashion (by T.S. and U.J.). For assessment of colony-forming cell capacity (clonogenicity), cells were plated in triplicate at various cell densities in self-renewal culture medium and 0.3% Bacto agar (Difco, Germany), in the presence or the absence of OHT (triplicate wells in six-well plates). Colonies (>50 cells) were counted after 7–9 days. For coculture experiments of FDCP-mix cells and OP9 cells (40), 2 × 105 FDCP-mix cells/six-well plate were seeded onto confluent OP9 cells in triplicate. Cocultures were kept in IMDM containing 10% FCS and horse serum, respectively, and in the presence or the absence of 1 μM OHT. Half the medium was replaced by fresh medium every 3 days. Cobblestone colonies were counted after 8–10 days. Ltk− and Jagged-transfected (JT) cell lines were kept in IMDM supplemented with 10% FCS. OP9 cells were cultured in αMEM containing 20% FCS and 10−4 M 2-ME. FDCP-mix cells were transfected with the mN1IC-green fluorescent protein (GFP) or CMVeGFP plasmids by electroporation as previously described (8). RBP-J-dependent trans-activation was measured as previously described (8) by transfecting rNERTneo or rneo cells with the reporter plasmid pGa981-6 (41), which carries a luciferase gene under the control of 12 RBP-J binding sites. Cells were treated with different concentrations of OHT for 24 h, and luciferase activity in cell lysates was determined. To obtain clones of the multipotent progenitor cell line FDCP-mix A7, in which translocation of the activated domain of mN1IC into the nucleus and RBP-J dependent trans-activation of target genes can be regulated, FDCP-mix A7 cells were transfected by electroporation with a retroviral vector carrying an intracellular domain of Notch1 fused to the hormone binding domain of the human estrogen receptor (rNERTneo) (8), and stable lines were established by G418 (Life Technologies Europe) selection. As a control, cells were transfected with the retroviral vector alone (rneo) (8) or with a retroviral vector carrying only the hormone binding domain of the human estrogen receptor of the rNERTneo construct (rERTneo). Cell clones derived from three independent transfections were used in this study. Cells were plated in self-renewal medium in the presence or the absence of OHT at 6 × 104/ml. After 24, 36, or 48 h, [3H]thymidine incorporation was measured as previously described (42). Data are expressed as mean counts per minute of triplicate wells ± SD. The percentage of cells undergoing apoptosis was determined quantitatively using the ApoAlert FITC-annexin V apoptosis kit (Clontech, Palo Alto, CA) as previously described (42). Cells were cultured under self-renewal conditions and in the absence or the presence of 1 μM OHT. Harvesting, electrophoresis, and Western blotting of protein extracts was performed as previously described (8). Fifty micrograms of protein was separated per lane. Abs specific for the HA tag (no. 3808-1; Clontech), the human estrogen receptor α (sc-8002), mNotch1 (sc-6014), PU.1 (T-21), M-CSF-R (sc-692), C/EBPα (14AA), and actin (C-2; all from Santa Cruz Biotechnology, Santa Cruz, CA) were used. The detected proteins were visualized by the ECL system (Amersham Pharmacia Biotech, Little Chalfont, U.K.). Total RNA extracts were harvested using RNA Stat 60 (Tel-Test, Friendswood, Tx) according to the manufacturer’s instructions. Electrophoresis and Northern blotting were performed using standard procedures. Twenty micrograms of total RNA was separated per lane. For hybridization, 32P (Amersham Pharmacia Biotech)-labeled (random primed DNA labeling kit; Roche) cDNA probes specific for C/EBPα, PU.1, M-CSF-R, and GAPDH were used. To inhibit de novo protein synthesis, 50 μg/ml cycloheximide (Sigma-Aldrich) was added where indicated 30 min before the addition of 1 μM OHT. FITC-, PE-, or allophycocyanin-conjugated mAbs directed against CD11b (Mac-1, clone M1/70), Ly-6A/E (Sca-1, clone D7), CD14 (clone rmC5–3), CD80 (clone B7-1), CD86 (clone B7-2), CD11c (clone HL3), CD40 (clone 3/23), MHC-II (clone AF6-120.1), Ly-6G (Gr-1, clone RB6-8C5), or their respective isotype controls were used (all from BD PharMingen Europe, Uppsala, Sweden). Cells were stained with Abs in PBS containing 3% FCS and Fc-Block (BD PharMingen Europe). FACS analysis was performed in the presence of propidium iodide (PI) for dead cell exclusion with a FACSCalibur machine and CellQuest software (BD Biosciences, Mountain View, CA), using standard procedures. Statistical differences were assessed using Student’s t test and ANOVA. Initially we attempted to express the activated domain of mN1IC constitutively in FDCP-mix cells. However, those clones that were obtained either failed to express the mN1IC protein or expressed an aberrantly sized mN1IC, as judged by Northern blot analysis, and none of the clones obtained was able to trans-activate the RBP-J pathway (data not shown). We thus assumed that mN1IC overexpression might be compromising the proliferation or viability of FDCP-mix cells or might interfere with self-renewal. Therefore, we sought to employ an inducible form of mN1IC (NERT) (8) that permits the conditional induction of mN1IC by OHT. To obtain clones of the multipotential progenitor cell line FDCP-mix A7 in which translocation of mN1IC into the nucleus can be regulated, FDCP-mix A7 cells were transfected by electroporation with a retroviral vector carrying the mN1IC fused to the hormone binding domain of the human estrogen receptor (rNERTneo; Fig. 1⇓A). As controls, cells were transfected either with a vector that does not contain the NERT cDNA (rneo) or with a vector carrying only the hormone binding domain of the human estrogen receptor (rERTneo). All vectors confer geneticin resistance to transfected cells. 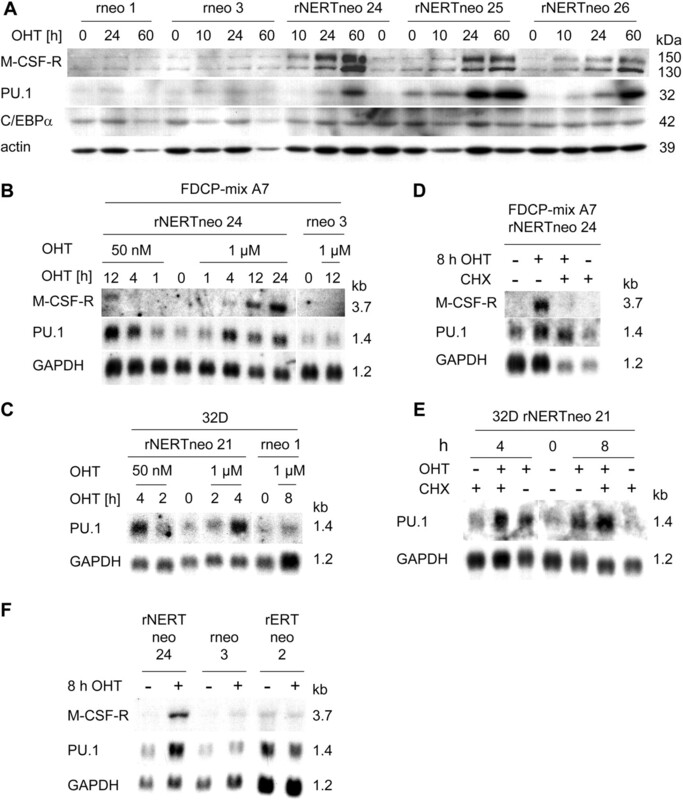 The expression of the correct sized NERT and ERT protein was confirmed by Western analysis using an Ab against human estrogen receptor α in cultures of rNERTneo and rERTneo FDCP-mix clones, respectively (Fig. 1⇓B and data not shown). The rNERTneo FDCP-mix clones were then tested for trans-activation of the RBP-J pathway in the presence or the absence of OHT. In the absence of OHT, no trans-activation of the RBP-J pathway was observed (Fig. 1⇓C). After addition of OHT, the RBP-J pathway was trans-activated depending on the concentration of OHT present in the cultures in all clones used in this study (Fig. 1⇓C). Control clones did not trans-activate the RBP-J pathway in the presence or the absence of OHT (Fig. 1⇓C and data not shown). Notch signaling is functional and inducible in FDCP-mix cell clones expressing the NERT fusion protein. A, Schematic diagram of the full-length mNotch1 receptor, the OHT-inducible NERT fusion protein and the retroviral expression plasmid used in this study. mN1, mouse Notch1; IC, intracellular; EGF, EGF repeats; LN, LIN/Notch repeats; M, transmembrane domain; R, RAM23 domain; A, ankyrin repeats; N, nuclear localization sequence; O, OPA sequence; P, pest sequence; ERT2, hormone binding domain of the human estrogen receptor α (OHT-sensitive mutant); sd/sa, splice donor/acceptor; neoR, neomycin resistance gene; LTR, viral long terminal repeat; MPSV, myeloproliferative sarcoma virus; SFFV, spleen focus-forming virus. The retroviral vector backbone contains the primer binding sequence from the mouse embryonal stem cell virus. B, Expression of ERT protein in transfected FDCP-mix clones. The correct sized ERT proteins were detected by Western blotting with an anti-human estrogen receptor α mAb. C, OHT treatment induces RBP-J-dependent trans-activation in a concentration-dependent manner in rNERTneo clones. The rNERTneo and rneo control clones were transfected in duplicate with a reporter plasmid carrying a luciferase gene under the control of 12 RBP-J binding sites. Cells were treated with different concentrations of OHT for 24 h, and luciferase activity in cell lysates was determined. The mean ± SEM corrected for transfection efficiency are shown. This experiment was repeated three times with virtually identical results. To analyze the effect of activated Notch1 on FDCP-mix cells, rNERTneo FDCP-mix cells were cultured in the presence or the absence of OHT under various conditions and monitored for changes in proliferation, survival, self-renewal capacity, and morphology. To evaluate the effects of activated Notch1 on cell proliferation, [3H]thymidine uptake into DNA of proliferating rNERTneo (clones 24, 25, 26, and 32), rERTneo (clones 2 and 5), and rneo (clones 1–3 and 5) FDCP-mix cells was measured in the presence or the absence of OHT under conditions optimal for self-renewal and proliferation, i.e., in the presence of high IL-3 (100 U/ml). In the absence of OHT, [3H]thymidine incorporation of rNERTneo FDCP-mix cells was virtually identical with that of rneo and rERT control FDCP-mix cells (Table I⇓ and Fig. 2⇓). However, the induction of mN1IC by OHT significantly reduced the proliferation of rNERTneo FDCP-mix cells; the reduction in [3H]thymidine incorporation for rNERTneo clones was 10–20% after addition of OHT for 24 h (Table I⇓) and up to 80% after addition of OHT for 48 h (Fig. 2⇓). Consistent with the terminally differentiated phenotype (see below), by day 7 (induction with 1 μM OHT) or day 10 (induction with 50 nM OHT) the proliferation of rNERTneo clones ceased entirely, and the cultures resulted in subsequent extinction (data not shown; three independent experiments). Proliferation of control rneo and rERTneo FDCP-mix cells was unaffected by OHT (Table I⇓ and Fig. 2⇓). Activated mN1IC reduces the proliferation of FDCP-mix cells. 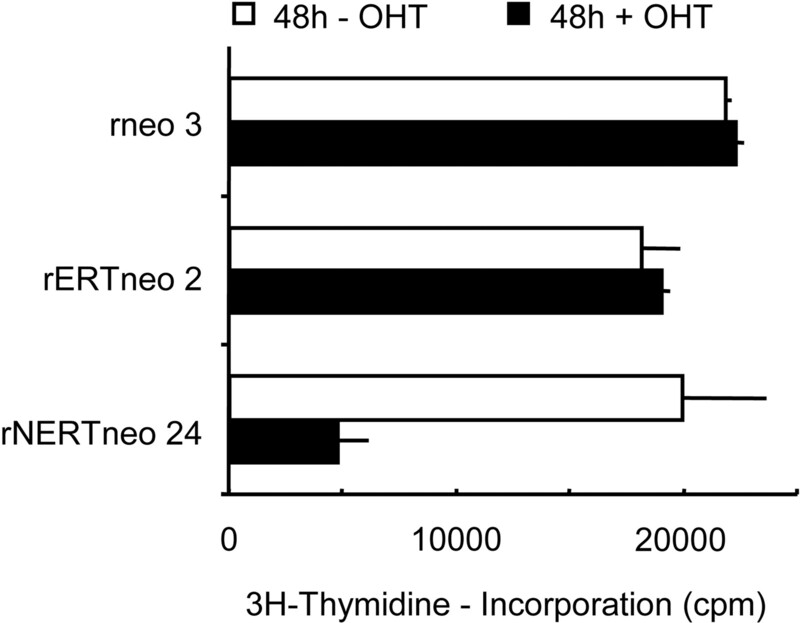 Cells were grown under self-renewal conditions and in the presence or the absence of 1 μM OHT for 48 h. [3H]Thymidine incorporation was measured in triplicate cultures as described in Materials and Methods. The proliferation rates of rneo, rNERTneo, and rERTneo FDCP-mix cell clones were within the same range, and no significant difference was observed (p > 0.1, by ANOVA). The mean ± SD of a representative experiment are shown. The reduction in the proliferation rate is significant for rNERTneo FDCP-mix clone 24 (p < 0.01), but not for rneo FDCP-mix clone 3 or rERTneo FDCP-mix clones 2 and 5 (p > 0.9 and p > 0.2, respectively). The experiments were repeated twice with virtually identical results. We next analyzed whether activated Notch1 has an influence on the apoptosis of FDCP-mix cells. Thus, the apoptosis of rNERTneo (clones 24–26) and rneo (clone 1–3 and 5) FDCP-mix cells was assessed in the presence of high IL-3 and in the presence or the absence of OHT using annexin V and, as an indication of cell viability, PI. Neither rNERTneo nor control rneo FDCP-mix cells showed a difference in the proportion of cells staining positively for either annexin V alone (apoptotic cells) or annexin V and PI (necrotic cells) in the presence or the absence of OHT (Table I⇑). The percentage of apoptotic cells in the presence of high IL-3 was never >8% regardless of the addition of OHT (Table I⇑). In the absence of cytokines or stromal cells, FDCP-mix cells rapidly undergo apoptosis (43). Although not anticipated by the results described above, we analyzed whether activated Notch1 could prevent apoptosis induced by cytokine withdrawal. IL-3 was removed from the culture medium of rNERTneo (clones 22, 24, 25, 26, and 32), rneo 3, and the parental FDCP-mix cells, and the cells were cultured in the presence of horse serum alone, either with or without OHT. As expected, all cells died within 48 h regardless of the induction of mN1IC by OHT (data not shown; three independent experiments), indicating that activated Notch1 does not enhance the survival of immature FDCP-mix cells in the absence of IL-3. Since we observed a high percentage of differentiated cells during the first weeks of selection of FDCP-mix cells transfected with the retroviral vector expressing activated Notch constitutively, we assumed that activated Notch1 may have an influence on the probability of self-renewal vs differentiation. Therefore, we determined the morphology and cell surface phenotype of rNERTneo FDCP-mix cells (clones 22, 24, 25, 26, and 32), control rneo FDCP-mix cells (clones 1–3 and 5), control rERTneo FDCP-mix cells (clones 2 and 5), and the parental FDCP-mix cells grown in the presence or the absence of OHT under conditions that normally promote self-renewal of FDCP-mix cells. In the absence of OHT, all cells showed a predominantly undifferentiated blast cell morphology (Fig. 3⇓A). In contrast, in the presence of OHT, mature granulocytes, macrophages, and dendritic cells appeared in all rNERTneo FDCP-mix cell clones, whereas in control clones the cells remained undifferentiated (Fig. 3⇓A). These results were further confirmed by FACS analyses using Abs directed against Mac-1, Sca-1, CD14, CD11c, CD80, CD86, CD40, and MHC-II (Fig. 3⇓, B and C). Time-course experiments revealed that differentiation of rNERTneo FDCP-mix cells along the myeloid lineage, i.e., into granulocytes, macrophages, and dendritic cells, increased rapidly after addition of OHT and continued over the time period analyzed (Fig. 3⇓ and data not shown). To further exclude that the NERT fusion protein results in different effects than the wild-type mN1IC, we expressed wild-type mN1IC transiently in FDCP-mix cells using a plasmid-based transient expression system in which a target protein is coexpressed with the enhanced GFP (8). FDCP-mix cells were transfected by electroporation with the mN1IC expression construct and, as a control, the eGFP expressing vector backbone alone. Two days after transfection, GFP-positive FDCP-mix cell populations were analyzed by two-color FACS analyses for expression of the cell surface markers Sca-1 and Mac-1. Under conditions that favor self-renewal, GFP-positive, mN1IC-expressing FDCP-mix cells contained a considerably higher number of Mac-1high/Sca-1+ cells, i.e., mature myeloid cells, than GFP-positive, control vector-expressing, FDCP-mix cells (32–34 vs 5–8%; p < 0.001; three independent experiments; data not shown). In line with our previous results (8), these data demonstrate that expression of the NERT fusion protein results in essentially the same effects as expression of the mN1IC protein in FDCP-mix cells. To prove that the increased differentiation by activated Notch1 results from differentiation induction and not from a selective influence on proliferation, we determined the absolute number of mature differentiated cells (Mac-1highSca-1+) in rNERTneo cell cultures (clones 24–26) and rneo control cultures (clone 1 and 3) grown under conditions that favor self-renewal and in the presence or the absence of 50 μM OHT for up to 10 days. Induction of activated Notch1 by addition of OHT increased the absolute numbers of mature differentiated cells 3- to 8-fold, whereas the absolute numbers of differentiated cells remained unchanged in control rneo FDCP-mix cell cultures in the presence of OHT. The increase in absolute numbers of mature cells by activated Notch1 in rNERTneo cultures is statistically significant (p < 0.01 for day 4, three independent experiments; p < 0.05 for days 7 and 10, two independent experiments, respectively; for all clones analyzed). Thus, these results demonstrate that activated Notch1 induces myeloid differentiation under conditions that favor self-renewal of FDCP-mix cells, i.e., in the presence of high concentrations of IL-3. Activated mN1IC induces myeloid differentiation under cytokine conditions that favor self-renewal. Four rneo, two rERTneo, and three rNERTneo FDCP-mix clones were cultured under self-renewal conditions (100 U/ml IL-3) for up to 15 days and in the presence or the absence of 50 nM or 1 μM OHT. Differentiation was followed by scoring morphology of May-Grünwald-Giemsa-stained cells and by three-color FACS analyses of living cells using Abs against Mac-1, Sca-1, CD14, CD11c, CD40, CD80, CD86, and MHC-II. The induction of differentiation by activated Notch1 is statistically significant (p < 0.001 for all rNERTneo FDCP-mix clones analyzed). A, Morphology of rNERTneo FDCP-mix cells and control FDCP-mix cells under self-renewal conditions and in the presence or the absence of 1 μM OHT for 3 days. Upper panels, Phase contrast micrographs of rNERTneo clone 24 and of rneo clone 1. OHT treatment leads to the typical morphology of myeloid differentiation (adherent cell clumps and adherent cells) in rNERTneo cultures and has no effect on rneo or rERTneo (data not shown) cultures. Magnification is 100-fold. Lower panels, Micrographs of May-Grunwald-Giemsa-stained cells of rNERTneo clone 24 and rERTneo clone 2. OHT treatment results in the appearance of mature granulocytes (depicted by the arrowheads) in the supernatant of rNERTneo FDCP-mix cultures. The rERTneo cells and rneo FDCP-mix cells (data not shown) retain an undifferentiated blast cell morphology regardless of the addition of OHT. Magnification is 630-fold. The experiment was repeated 16 times for rNERTneo and rneo FDCP-mix clones and three times for rERTneo FDCP-mix clones with identical results. B, Myeloid surface marker analysis. Undifferentiated FDCP-mix cells express low levels of Mac-1 (left quadrants of Mac-1-stained cells). Early differentiated cells show increased Mac-1 expression and do not express Sca-1 (lower right quadrant of Mac-1/Sca-1 double-stained cells). Mature myeloid cells express high levels of Mac-1 and Sca-1 (upper right quadrant of Mac-1/Sca-1 double-stained cells). Representative FACS analyses of one rERTneo, two rneo, and two rNERTneo FDCP-mix clones treated with 1 μM OHT are shown. The experiment was repeated five times with 50 nM (data not shown) and four times with 1 μM OHT, yielding virtually identical results. To determine whether the induction of differentiation by activated Notch1 leads to a reduction of the self-renewal capacity of FDCP-mix cells, we measured the number of colony-forming and cobblestone colony-forming cells of rNERTneo and control FDCP-mix cells. To do this, rNERTneo (clones 22, 24–26, and 32), rERTneo (clone 2), and rneo FDCP-mix cells (clone 1–3 and 5) were first cultured for 4 days in liquid self-renewal medium in the presence or the absence of OHT and then cloned either in semisolid medium containing high concentrations of IL-3 or on mouse stromal cells in the absence of added growth factors. In the presence of OHT, the clonogenicity in high IL-3 was markedly reduced for rNERTneo, but not for rERTneo and rneo, FDCP-mix cells (Table II⇓). The reduction in clonogenicity was dependent on the amount of OHT present in the medium (Table II⇓) and correlated with the RBP-J trans-activation induced (compare Table II⇓ and Fig. 1⇑). To determine whether the reduction in clonogenicity by activated Notch1 is reversible, cloning of cells after exposure to OHT was performed in the absence of OHT. As shown in Table II⇓, the number of colony-forming cells was markedly reduced after only 4 days of incubation with OHT, suggesting that the majority of cells had irreversibly lost their self-renewal capacity. Furthermore, when rNERTneo FDCP-mix cells were cultured on stromal cells, the number of cobblestone colonies forming in the presence of OHT was reduced to 1/10th the cobblestone colonies forming in the absence of OHT (data not shown; p < 0.01; five independent experiments; clone rNERTneo 24 and 32). Control rneo FDCP-mix cells showed no significant difference in cobblestone-forming ability in the presence or the absence of OHT (data not shown; p > 0.9; clone rneo 1). Taken together, these data show that signaling by Notch1 reduces the self-renewal capacity of FDCP-mix cells. Since differentiation into myeloid cells in rNERTneo FDCP-mix cells by the induction of activated Notch1 also occurred in the absence of lineage-affiliated cytokines we asked whether cytokines that normally promote differentiation of FDCP-mix cells could modulate the differentiation programs activated by mN1IC. In the presence of GM-CSF (G/M differentiation conditions), differentiation of FDCP-mix cells is directed along the granulocyte and macrophage lineage (36), in the presence of GM-CSF and G-CSF (G differentiation conditions) along the granulocyte lineage (37), and in the presence of GM-CSF and M-CSF (M differentiation conditions) along the macrophage lineage (39). Thus, rNERTneo and control FDCP-mix cells were cultured under conditions that normally promote myeloid differentiation of FDCP-mix cells in the presence or the absence of OHT and were monitored for changes in morphology and for the expression of cell surface markers. Regardless of the addition of OHT, rNERTneo FDCP-mix cells differentiated predominantly along the granulocyte lineage in the presence of GM-CSF and G-CSF and along the macrophage lineage in the presence of GM-CSF and M-CSF (Fig. 4⇓A). Time-course experiments, however, revealed an accelerated onset of differentiation of rNERTneo FDCP-mix cells in the presence of OHT compared with cells differentiated in the absence of OHT (Fig. 4⇓, A and B). Differentiation of rERTneo and rneo FDCP-mix was unaltered by the addition of OHT (Fig. 4⇓B and data not shown). To analyze this further, we determined the colony-forming ability of rNERTneo and control rneo FDCP-mix cells during cytokine-induced differentiation. The number of clonogenic cells of differentiating rNERTneo FDCP-mix cells was markedly reduced after exposure to OHT (data not shown; p < 0.01; five independent experiments), whereas control rneo FDCP-mix cells showed a similar decrease in clonogenicity during cytokine-induced differentiation in the presence or the absence of OHT (data not shown; p > 0.9). Thus, the accelerated differentiation induced by activated Notch1 in the presence of lineage-affiliated cytokines correlated with a decrease in self-renewal capacity. Taken together, our data show that activated Notch1 accelerates the differentiation of FDCP-mix cells along myeloid lineages, but does not alter lineage decisions between these myeloid lineages in the presence of the respective lineage-affiliated cytokines. Activated mN1IC accelerates cytokine-induced myeloid differentiation. Three rneo, two rERTneo, and four rNERTneo FDCP-mix clones were cultured in duplicate under cytokine conditions that favor granulocytic (G; reduction of IL-3, addition of GM-CSF and G-CSF), monocytic (M; reduction of IL-3, addition of GM-CSF and M-CSF), or granulocytic/monocytic (G/M; reduction of IL-3, addition of GM-CSF) differentiation and in the presence or the absence of 50 nM or 1 μM OHT. Differentiation was followed by scoring the morphology of May-Grunwald-Giemsa-stained cells and two-color FACS analysis of living cells using Abs against Mac-1 and Sca-1. The acceleration of cytokine-induced differentiation by activated Notch was statistically significant for all rNERTneo FDCP-mix clones and time points analyzed (p < 0.001). A, Morphology of differentiating rNERTneo and rneo FDCP-mix cells. Open arrowheads depict some mature neutrophil granulocytes; filled arrowheads show some mature macrophages. Cells were stained with May-Grunwald-Giemsa. Magnification is 630-fold. The experiment was repeated 11 (G/M, G, M) times with virtually identical results. B, Myeloid surface marker analysis. Results for one representative rneo and one rNERTneo clone are shown for GM conditions, respectively. The experiment was repeated six times (G/M, G, M; 50 nM OHT) for rneo and rNERTneo FDCP-mix cells and three times (G/M; 1 μM OHT; data not shown) for rneo, rERTneo, and rNERT FDCP-mix cells with virtually identical results. FDCP-mix cells express mNotch1 mRNA (44) and protein (data not shown). Thus, since the activated form of Notch1 promoted myeloid differentiation of FDCP-mix cells, we asked whether physiological activation of Notch signaling by its ligand Jagged-1 would lead to a similar phenotype. To test this hypothesis, we used a fibroblast cell line engineered to express the Notch ligand Jagged1 (JT cells) (45) for coculture with FDCP-mix cells. JT cells can activate Notch in cocultured C2C12 myoblasts and thereby prevent muscle cell differentiation (45). The expression of Jagged1 on JT cells, but not on the parental mouse Ltk− cells, was confirmed by Western blot analysis (data not shown). To analyze the influence of the Jagged/Notch pathway on FDCP-mix cell differentiation, FDCP-mix cells were cultured under conditions that favor either self-renewal or differentiation and in the presence of JT or Ltk− fibroblasts and were monitored for morphology and expression of the cell surface markers Mac-1, Sca-1, and Gr-1. Under conditions that favor granulocyte differentiation, i.e., in the presence of GM-CSF and G-CSF, coculture of FDCP-mix cells with JT cells resulted in an accelerated onset of differentiation along the granulocyte lineage compared with FDCP-mix cells cocultured with parental Ltk− cells or with FDCP-mix cells cultured in granulocyte differentiation medium alone (Fig. 5⇓). Under conditions that favor self-renewal, i.e., in the presence of high IL-3 and in the absence of cytokines normally required for FDCP-mix cell differentiation, FDCP-mix cells cocultured with JT cells contained a considerably higher number of differentiated myeloid cells than FDCP-mix cells cultured in high IL-3, whereas FDCP-mix cells cocultured with the parental Ltk− cells remained undifferentiated (Fig. 5⇓). The induction of myeloid differentiation of FDCP-mix cells by coculture with Jagged1-expressing cells in the absence of other physiological inducers of differentiation was similar to the effects of activated mN1IC on FDCP-mix cells (compare Figs. 3–5⇑⇑⇓). Thus, in line with previous work showing that presentation of the Notch ligands Delta-1 and Jagged-1 to murine bone marrow cells or human monocytes, respectively, accelerates differentiation into myeloid dendritic cells in the presence of GM-CSF (32, 33), these results indicate a physiological role for activated mNotch1IC in inducing myeloid differentiation of the multipotent progenitor cells FDCP-mix. The Jagged-1/Notch pathway induces and accelerates myeloid differentiation. For the activation of endogenous Notch receptors, FDCP-mix A4 cells were cocultured with JT cells expressing the Notch ligand Jagged-1. As a control, FDCP-mix cells were cocultured with parental Ltk− cells not expressing Jagged-1 or were cultured in suspension medium only. Differentiation was monitored by FACS analysis of living cells and morphological analysis (data not shown) for up to 6 days. Cells were cultured under cytokine conditions favoring self-renewal (100 U/ml IL-3) or that induced granulocytic differentiation (reduction of IL-3 and addition of GM-CSF and G-CSF). Induction of myeloid differentiation by coculture with JT cells was statistically significant (p < 0.001; eight independent experiments). In a search for candidate genes that may mediate the observed effects of Notch1 signaling, we reasoned that Notch1 signaling may activate transcription of lineage-affiliated transcription factors involved in the induction of myeloid differentiation, i.e., PU.1 and C/EBPα (46, 47, 48). Thus, we determined the protein and RNA levels of PU.1 and C/EBPα in rNERTneo (clones 24–26), control rERT (clones 2 and 5), and rneo FDCP-mix cells (clones 1 and 3) during culture in self-renewal conditions in the presence or the absence of OHT. To determine whether the induction of myeloid differentiation by Notch signaling would also include the up-regulation of cytokine receptors, we further determined the protein and RNA levels of the M-CSF-R, a cytokine receptor and target gene of PU.1 required for the development of macrophages (49, 50). In the absence of OHT, rNERTneo and control FDCP-mix cells expressed low levels of PU.1 and C/EBPα (Fig. 6⇓, A, B, and F), consistent with their phenotype as multipotent hemopoietic progenitor cells (51). After addition of OHT, PU.1 and M-CSF-R RNA and protein increased rapidly in rNERTneo, but not in rERTneo or rneo, FDCP-mix cells (Fig. 6⇓, A, B, and F). In both, rNERTneo and rneo FDCP-mix cells, C/EBPα protein (Fig. 6⇓A) and RNA (data not shown) levels remained unchanged by the addition of OHT. To confirm that the up-regulation of PU.1 by activated Notch1 is generally involved in the induction of myeloid differentiation and is not a specific feature of FDCP-mix cells, we determined whether PU.1 expression was similarly affected by activated Notch1 in the granulocytic progenitor cell line 32D. In 32D cells, Notch signaling promotes granulocytic differentiation (8). Thus, we determined RNA levels of PU.1 in 32D cell lines that expressed an OHT-inducible form of activated Notch1 (rNERTneo 32D) and in control rneo 32D cells (8) during culture in self-renewing conditions in the presence or the absence of OHT. As shown in Fig. 6⇓C, PU.1 RNA rapidly increased in rNERTneo, but not in control rneo, 32D cells after the addition of OHT. Taken together, these data show that activated Notch1 specifically up-regulates the expression of PU.1 in multipotent and granulocytic progenitor cells. Activated mN1IC directly up-regulates PU.1. Three rNERTneo FDCP-mix clones, two rERTneo FDCP-mix clones, two rneo FDCP-mix clones, two rNERTneo 32D clones, and one rneo 32D clone cultured in self-renewal conditions were treated with 50 nM or 1 μM OHT for up to 60 h (three independent experiments). A, Activated mN1IC increases levels of PU.1 and M-CSF-R, but not of C/EBPα, proteins in undifferentiated FDCP-mix cells. A representative Western blot analysis is shown. B, Activated Notch1 increases levels of PU.1 and M-CSF-R RNA in undifferentiated FDCP-mix cells. A representative Northern blot analysis is shown. Activated Notch1 did not alter levels of C/EBPα RNA (data not shown). C, Activated Notch1 increases levels of PU.1 RNA in undifferentiated 32D cells. A representative Northern blot analysis is shown. D, and E, PU.1 is a direct target gene of activated Notch in FDCP-mix (D) and 32D cells (E). A representative Northern blot analysis of rNERTneo cells 4 or 8 h after addition of OHT is shown. For inhibition of translation, cells were grown in the presence of cycloheximide (CHX). CHX treatment alone did not alter PU.1 or M-CSF-R RNA levels in rneo control cells (data not shown). F, PU.1 or M-CSF-R RNA levels were not altered in rERTneo control FDCP-mix cells. A representative Northern blot analysis is shown. To determine whether activated Notch1 up-regulates the expression of PU.1 and the M-CSF-R directly or indirectly, PU.1 and M-CSF-R RNA levels were analyzed in rNERTneo and rneo cells after the induction of Notch signaling by OHT and in the presence of cycloheximide to inhibit translation. As shown in Fig. 6⇑, D and E, protein synthesis was required for up-regulation of M-CSF-R RNA, but not for PU.1 RNA, indicating that PU.1 is a direct target gene of Notch1, whereas the expression of the M-CSF-R gene in FDCP-mix cells may be indirectly induced via PU.1. Hemopoietic stem cells self-renew and differentiate in response to local environmental signals provided by hemopoietic stromal cells in bone marrow. Here we have presented evidence suggesting that Jagged1/Notch signaling is involved in this process by inducing myeloid differentiation of multipotent hemopoietic progenitor cells. Using an inducible system, we demonstrated that activated Notch1 reduces the self-renewal capacity of the multipotent hemopoietic cell line FDCP-mix with concomitant differentiation along the granulocyte, macrophage, and dendritic cell lineages. Apoptosis of FDCP-mix cells was not influenced by activated Notch, and proliferation of undifferentiated FDCP-mix cells was only slightly inhibited. Thus, the observed increase in differentiation was not a consequence of selective apoptosis or proliferation mediated by activated Notch. We also showed that presentation of the Notch ligand Jagged1 to FDCP-mix cells expressing Notch receptors endogenously resulted in an increase in myeloid differentiation, suggesting that physiological activation of Notch by its ligand induces multipotent hemopoietic progenitor cells to differentiate along the myeloid lineages. Differentiation induced by activated Notch, however, required the presence of hemopoietic cytokines for the production of differentiated cells. This raises the possibility that signals through Notch and cytokine receptors act in concert to direct the development of myeloid cells from hemopoietic stem cells. Whether activated cytokine receptors induce differentiation into a particular lineage or only allow proliferation and survival of receptor-presenting cells that are committed to differentiate by an endogenous program running independently of cytokine receptor activation is still a matter of debate (17, 18). Based on available evidence, we had formulated a model (hybrid model) (36, 52) that integrates both features. The hybrid model predicts that ligand-mediated activation of cytokine receptors would lead to activation of genes required for survival and proliferation, but also to activation of a set of transcription factors that interact with the endogenous program of differentiation in the determination of lineage commitment. What constitutes this endogenous program, which may be in part mediated by interaction of stem cells with stromal cells (52), had not been defined. We have shown here that activated Notch has no proliferative or antiapoptotic action on hemopoietic stem cells, but induces commitment to the myeloid lineage. Thus, we propose that Jagged1/Notch signaling participates in the initiation and maintenance of the endogenous program by priming lineage-specific transcription factors (see below). Signaling by cytokines would be required for survival and proliferation. In addition, cytokine signaling would further result in the activation of factors that influence differentiation, e.g., expression of lineage-specific receptors (52, 53). The final choice of fate would thus be determined by combinations between Notch and cytokine signaling and possibly other as yet unknown factors. Further studies will elucidate how the signaling pathways of Notch and cytokines are linked at the molecular level. Our findings that Notch signaling induces myeloid differentiation of more restricted (8) and of multipotent progenitor cells (this study) challenge the prevailing view that Notch signaling in myeloid hemopoiesis functions principally to inhibit the differentiation of progenitor cells, thereby allowing expansion of the progenitor pool (16). This view arose from studies in which constitutive ectopic expression of activated forms of Notch or presentation of Notch ligands to hemopoietic cells led to a block or a delay in the differentiation of myeloid progenitor or multipotent stem cells (24, 25, 26, 27, 28, 29, 30, 54, 55, 56). Explanations for the apparent discrepancy may be given by the experimental procedures used. 1) In view of our results showing that constitutive expression of a functional activated Notch is not compatible with continuous proliferation of multipotent hemopoietic progenitor cells, it is likely that mutants in which the induction of differentiation by Notch signaling is not functional were selected in those studies attempting constitutive expression of activated Notch (23, 24, 25, 54). In a previous study using the 32D cell line we had addressed this possibility by comparing the results of constitutive and inducible expression of activated Notch1 (8). While directly after activation of Notch signaling granulocytic differentiation was induced, the prolonged expression of constitutively active Notch1 resulted, as described previously (24, 25), in mutants of 32D cells that were blocked in differentiation. 2) Soluble ligands of Notch, as used in other studies that suggested a block in differentiation (26, 29, 30, 55, 56), may act as dominant negative forms (57, 58) and may not substitute for ligands presented by stromal cells (59). This interpretation gained strong support from a publication that appeared during the revision of this manuscript (59). While membrane-bound Delta-4 induced functional Notch signaling and impaired the formation of early hemopoietic stem cells, soluble Delta-4 had no effect on hemopoiesis in vivo and resulted in the expansion of human progenitor cells in vitro (59). 3) The outcome of coculture experiments may be influenced by many additional factors unrelated to the expression of Notch ligands, such as cytokines and other factors produced by stromal cells. 4) Notch ligands Delta and Jagged may have differential effects (60). 5) Notch signaling is cell type dependent and may lead to different outcomes in different hemopoietic progenitor and stem cell stages (59). Because in most studies suggesting a block of differentiation functional signaling by the Notch receptor has not been shown in the cell types analyzed, it is difficult to draw further conclusions from these studies regarding the function of Notch. Further evidence arguing against a block of myeloid differentiation by Notch signaling comes from in vivo studies. First, to date exclusively T cell tumors and no undifferentiated or myeloid leukemias have been observed when activated forms of Notch or Notch ligands are ectopically expressed in hemopoietic cells as a result of chromosomal translocations (61) or experimentally (59, 62, 63, 64, 65). Second, mice reconstituted with bone marrow stem cells expressing constitutive active Notch1 did not show a block or delay in myeloid differentiation, but instead demonstrated a decrease in lymphomyeloid progenitors (66) and increased myeloid maturation (67). Third, constitutive expression of membrane-bound Delta-4 strongly reduced the formation of early stem cells in mice and did not lead to stem cell expansion (59). However, it is difficult to determine in vivo whether this reflects an influence of Notch on survival, proliferation, or lineage commitment of hemopoietic stem cells. In invertebrates, as in vertebrates, Notch can exhibit all these activities (1). Our data presented here suggest that Notch signaling instructively induces myeloid differentiation. Under conditions that normally only allow self-renewal, activation of Notch in FDCP-mix cells resulted in the generation of differentiated myeloid cells with concomitant loss of self-renewal capacity. Although Notch signaling also reduced the proliferation of multipotent (this study) and more restricted myeloid progenitors (42), the absolute number of differentiated cells produced by activation of Notch was increased. Furthermore, activated Notch increased not only the extent, but also the rate, of myeloid differentiation. Both activated Notch and hemopoietic cytokines such as GM-CSF promoted myeloid differentiation; however, myeloid differentiation was accelerated in response to Notch signaling. An effect on apoptosis of undifferentiated FDCP-mix cells was not observed. Taken together, these data rule out the possibility that Notch signaling promotes myeloid development by selection, rather than instruction, in hemopoietic progenitor cells. Thus, in parallel to the function of Notch signaling in hemopoiesis of Drosophila (68), Notch signaling is not involved in maintaining pools of undifferentiated hemopoietic cells, but plays an instructive role in the differentiation of myeloid cells. Hematopoietic stem cells can differentiate along the B, T, and myeloid lineages. Combining our results with data from recent studies (66), we propose that activated Notch1 reduces self-renewal and regulates the myeloid vs lymphoid cell fate outcome of hemopoietic stem cells. In a search for candidate genes that may mediate these effects of Notch1 signaling, we reasoned that Notch signaling may activate transcription of the PU.1 gene, a transcription factor involved in the specification of myeloid vs B lymphocyte cell fate (46). PU.1 is essential for myeloid (macrophage, dendritic cell, and granulocyte) and lymphocyte development and regulates the differentiation and proliferation of myeloid and B-lineage progenitors by controlling the expression of myeloid and B-lineage-specific gene expression programs, including the gene encoding the M-CSF-R (69, 70). A low concentration of PU.1 protein allows the B cell fate, whereas a high concentration induces macrophage differentiation and blocks B cell development (46). The PU.1 gene is expressed at low levels in multipotent progenitors and is induced specifically at the onset of myeloid differentiation (51). Interestingly, under conditions that normally only allow self-renewal, overexpression of PU.1 in the multipotent progenitor cell line FDCP-mix results in decreased self-renewal capacity and priming of myeloid differentiation (47). How PU.1 expression is regulated, however, is still unclear. We found that activation of Notch signaling rapidly increased the expression of PU.1 and M-CSF-R. Protein synthesis was required for up-regulation of M-CSF-R RNA, but not for PU.1 RNA, indicating that PU.1 is a direct target gene of Notch1, whereas expression of the M-CSF-R gene may be indirectly induced via PU.1. Activated Notch had no effect on the expression of the C/EBPα gene, another lineage-affiliated transcription factor that is required for granulocyte development (48). Thus, Notch signaling targets specific transcriptional regulators of the hemopoietic system. Further work will determine whether and which other lineage-affiliated transcription factors may be activated by Notch signaling in the hemopoietic system and whether similar mechanisms have a role to play in mediating the differentiation induction by Notch signaling in other cell systems. Taken together, our results support the model that up-regulation of PU.1 expression by Notch signaling contributes to the induction of myeloid differentiation and to the blockade of B cell development. Our study further suggests that a physiological extrinsic signal provided by Jagged/Notch signaling directly activates the expression of a lineage-affiliated transcription factor, PU.1, which specifies distinct cell fates in the hemopoietic system, and provides evidence that hemopoietic commitment is extrinsically regulated. We thank P. Chambon, M. Cross, S.-I. Nishikawa, C. Stocking, L. Strobl, T. Tamura, D. Tenen, G. Weinmaster, and U. Zimber-Strobl for providing reagents; D. Gast and C. Kuklik-Roos for expert technical assistance; and G. Bornkamm and W. Ostertag for critical reading of the manuscript. This report represents a part of the doctoral thesis by N.R. and part of the diploma thesis by H.K. ↵1 This work was supported by the Deutsche Forschungsgemeinschaft (Research Group Regulatory Protein Networks WI 319/11-3 Project 9 and Priority Program 1109 Embryonic and Somatic Stem Cells-Regenerative Systems for Cell and Tissue Repair Project Notch Signaling in development, to U.J.). ↵3 Abbreviations used in this paper: NotchIC, intracellular domain of Notch; GFP, green fluorescent protein; JT, Jagged-transfected; M-CSF-R, M-CSF receptor; mN1IC, intracellular domain of mouse Notch1; NERT, OHT-inducible mN1IC; OHT, 4-hydroxytamoxifen; PI, propidium iodide; rERTneo, rneo vector carrying the OHT-responsive hormone binding domain of the human estrogen receptor; rneo, retroviral vector carrying the neo gene as a selection marker; rNERTneo, rneo vector carrying an intracellular domain of Notch1 fused to the hormone binding domain of the human estrogen receptor. Artavanis-Tsakonas, S., M. D. Rand, R. J. Lake. 1999. Notch signaling: cell fate control and signal integration in development. Science 284:770. Tamura, K., Y. Taniguchi, S. Minoguchi, T. Sakai, T. Tun, T. Furukawa, T. Honjo. 1995. Physical interaction between a novel domain of the receptor Notch and the transcription factor RBP-Jκ/Su(H). Curr. Biol. 5:1416. Jarriault, S., C. Brou, F. Logeat, E. H. Schroeter, R. Kopan, A. Israel. 1995. Signalling downstream of activated mammalian Notch. Nature 377:355. Kurooka, H., T. Honjo. 2000. Functional interaction between the mouse Notch1 intracellular region and histone acetyltransferases PCAF and GCN5. J. Biol. Chem. 275:17211. Bresnick, E. H., J. Chu, H. Christensen, B. Lin, J. Norton. 2000. Linking Notch signaling, chromatin remodeling, and T-cell leukemogenesis. J. Cell. Biochem. 35:46. Greenwald, I.. 1994. Structure/function studies of lin-12/Notch proteins. Curr. Opin. Genet. Dev. 4:556. Weinmaster, G.. 1997. The ins and outs of Notch signaling. Mol. Cell. Neurosci. 9:91. Schroeder, T., U. Just. 2000. Notch signalling via RBP-J promotes myeloid differentiation. EMBO J. 19:2558. Uyttendaele, H., V. Closson, G. Wu, F. Roux, G. Weinmaster, J. Kitajewski. 2000. Notch4 and Jagged-1 induce microvessel differentiation of rat brain endothelial cells. Microvasc. Res. 60:91. Tanigaki, K., F. Nogaki, J. Takahashi, K. Tashiro, H. Kurooka, T. Honjo. 2001. Notch1 and Notch3 instructively restrict bFGF-responsive multipotent neural progenitor cells to an astroglial fate. Neuron 29:45. Lowell, S., P. Jones, I. Le Roux, J. Dunne, F. M. Watt. 2000. Stimulation of human epidermal differentiation by Delta-Notch signalling at the boundaries of stem-cell clusters. Curr. Biol. 10:491. Gaiano, N., J. S. Nye, G. Fishell. 2000. Radial glial identity is promoted by Notch1 signaling in the murine forebrain. Neuron 26:395. Deftos, M. L., E. Huang, E. W. Ojala, K. A. Forbush, M. J. Bevan. 2000. Notch1 signaling promotes the maturation of CD4 and CD8 SP thymocytes. Immunity 13:73. Morrison, S. J., S. E. Perez, Z. Qiao, J. M. Verdi, C. Hicks, G. Weinmaster, D. J. Anderson. 2000. Transient Notch activation initiates an irreversible switch from neurogenesis to gliogenesis by neural crest stem cells. Cell 101:499. Allman, D., F. G. Karnell, J. A. Punt, S. Bakkour, L. Xu, P. Myung, G. A. Koretzky, J. C. Pui, J. C. Aster, W. S. Pear. 2001. Separation of Notch1 promoted lineage commitment and expansion/transformation in developing T cells. J. Exp. Med. 194:99. Milner, L. A., A. Bigas. 1999. Notch as a mediator of cell fate determination in hematopoiesis: evidence and speculation. Blood 93:2431. Enver, T., C. M. Heyworth, T. M. Dexter. 1998. Do stem cells play dice?. Blood 92:348. Metcalf, D.. 1998. Lineage commitment and maturation in hematopoietic cells: the case for extrinsic regulation. Blood 92:345. Tenen, D. G., R. Hromas, J. D. Licht, D.-E. Zang. 1997. Transcription factors, normal myeloid development, and leukemia. Blood 90:489. Cantor, A. B., S. H. Orkin. 2001. Hematopoietic development: a balancing act. Curr. Opin. Genet. Dev. 11:513. Cross, M., T. Enver. 1997. The lineage commitment of haemopoietic progenitor cells. Curr. Opin. Genet. Dev. 7:609. Osborne, B., L. Miele. 1999. Notch and the immune system. Immunity 11:653. Tan-Pertel, H. T., L. Walker, D. Browning, A. Miyamoto, G. Weinmaster, J. C. Gasson. 2000. Notch signaling enhances survival and alters differentiation of 32D myeloblasts. J. Immunol. 165:4428. Milner, L. A., A. Bigas, R. Kopan, C. Brashem-Stein, I. D. Bernstein, D. I. Martin. 1996. Inhibition of granulocytic differentiation by mNotch1. Proc. Natl. Acad. Sci. USA 93:13014. Bigas, A., D. I. Martin, L. A. Milner. 1998. Notch1 and Notch2 inhibit myeloid differentiation in response to different cytokines. Mol. Cell. Biol. 18:2324. Li, L., L. A. Milner, Y. Deng, M. Iwata, A. Banta, L. Graf, S. Marcovina, C. Friedman, B. J. Trask, L. Hood, et al 1998. The human homolog of rat Jagged1 expressed by marrow stroma inhibits differentiation of 32D cells through interaction with Notch1. Immunity 8:43. Jones, P., G. May, L. Healy, J. Brown, G. Hoyne, S. Delassus, T. Enver. 1998. Stromal expression of Jagged 1 promotes colony formation by fetal hematopoietic progenitor cells. Blood 92:1505. Varnum-Finney, B., L. E. Purton, M. Yu, C. Brashem-Stein, D. Flowers, S. Staats, K. A. Moore, I. Le Roux, R. Mann, G. Gray, et al 1998. The Notch ligand, Jagged-1, influences the development of primitive hematopoietic precursor cells. Blood 91:4084. Karanu, F., B. Murdoch, L. Gallacher, D. Wu, M. Koremoto, S. Sakano, M. Bhatia. 2000. The Notch ligand Jagged-1 represents a novel growth factor of human hematopoietic stem cells. J. Exp. Med. 9:1365. Karanu, F., B. Murdoch, T. Miyabayashi, M. Ohno, M. Koremoto, L. Gallacher, D. Wu, A. Itoh, S. Sakano, M. Bhatia. 2001. Human homologues of Delta-1 and Delta-4 function as mitogenic regulators of primitive human hematopoietic cells. Blood 97:1960. Walker, L., M. Lynch, S. Silverman, J. Fraser, J. Boulter, G. Weinmaster, J. C. Gasson. 1999. The Notch/Jagged pathway inhibits proliferation of human hematopoietic progenitors in vitro. Stem Cells 17:162. Mizutani, K., T. Matsubayashi, S. Iwase, T. S. Doi, K. Kasai, M. Yazaki, Y. Wada, T. Takahashi, Y. Obata. 2000. Murine Delta homologue, mDelta-1, expressed on feeder cells controls cellular differentiation. Cell Struct. Funct. 25:21. Weijzen, S., M. Verlders, A. Elmishad, P. Bacon, J. Panella, B. Nickoloff, L. Miele, M. Kast. 2002. The Notch ligand Jagged-1 is able to induce maturation of monocyte-derived human dendritic cells. J. Immunol. 169:4273. Spooncer, E., D. Boettiger, T. M. Dexter. 1984. Continuous in vitro generation of multipotential stem cell clones from src-infected cultures. Nature 310:228. Spooncer, E., C. M. Heyworth, A. Dunn, T. M. Dexter. 1986. Self-renewal and differentiation of interleukin-3-dependent multipotent stem cells are modulated by stromal cells and serum factors. Differentiation 31:111. Just, U., C. Stocking, E. Spooncer, T. M. Dexter, W. Ostertag. 1991. Expression of the GM-CSF gene after retroviral transfer in hematopoietic stem cell lines induces synchronous granulocyte-macrophage differentiation. Cell 64:1163. Heyworth, C. M., T. M. Dexter, O. Kan, A. D. Whetton. 1990. The role of hemopoietic growth factors in self-renewal and differentiation of IL-3-dependent multipotential stem cells. Growth Factors 2:197. Schroeder, T., C. Lange, J. Strehl, U. Just. 2000. Generation of functionally mature dendritic cells from the multipotential stem cell line FDCP-mix. Br. J. Haematol. 111:890. Helftenbein, G., K. Krusekopf, U. Just, M. Cross, W. Ostertag, H. Niemann, T. Tamura. 1996. Transcriptional regulation of the c-fms proto-oncogene mediated by granulocyte/macrophage colony-stimulating factor (GM-CSF) in murine cell lines. Oncogene 12:931. Kodama, H., M. Nose, S. Niida, S. Nishikawa. 1994. Involvement of the c-kit receptor in the adhesion of hematopoietic stem cells to stromal cells. Exp. Hematol. 22:979. Strobl, L. J., H. Hofelmayr, C. Stein, G. Marschall, M. Brielmeier, G. Laux, G. W. Bornkamm, U. Zimber-Strobl. 1997. Both Epstein-Barr viral nuclear antigen 2 (EBNA2) and activated Notch1 transactivate genes by interacting with the cellular protein RBP-Jκ. Immunobiology 198:299. Schroeder, T., U. Just. 2000. mNotch1 signaling reduces proliferation of myeloid progenitor cells by altering cell-cycle kinetics. Exp. Hematol. 28:1206. Williams, G. T., C. A. Smith, E. Spooncer, T. M. Dexter, D. R. Taylor. 1990. Haemopoietic colony stimulating factors promote cell survival by suppressing apoptosis. Nature 343:76. Milner, L. A., R. Kopan, D. I. Martin, I. D. Bernstein. 1994. A human homologue of the Drosophila developmental gene, Notch, is expressed in CD34+ hematopoietic precursors. Blood 83:2057. Lindsell, C. E., C. J. Shawber, J. Boulter, G. Weinmaster. 1995. Jagged: a mammalian ligand that activates Notch1. Cell 80:909. DeKoter, R. P., H. Singh. 2000. Regulation of B lymphocyte and macrophage development by graded expression of PU.1. Science 288:1439. McIvor, Z., S. Hein, H. Fiegler, T. Schroeder, C. Stocking, U. Just, M. Cross. 2003. The transient expression of Pu.1 commits multipotent progenitors to a myeloid fate, while continued expression favours macrophage over granulocyte differentiation. Exp. Hematol. 31:39. Zhang, D. E., P. Zhang, N. D. Wang, C. J. Hetherington, G. J. Darlington, D. G. Tenen. 1997. Absence of granulocyte colony-stimulating factor signaling and neutrophil development in CCAAT enhancer binding protein α-deficient mice. Proc. Natl. Acad. Sci. USA 94:569. Zhang, D.-E., C. J. Hetherington, H.-M. Chen, D. Tenen. 1994. The macrophage transcription factor PU.1 directs tissue-specific expression of the macrophage colony-stimulating factor receptor. Mol. Cell. Biol. 14:373. Yoshida, H., S.-I. Hayashi, T. Kunisada, M. Ogawa, S. Nishikawa, H. Okamura, T. Sudo, L. D. Shultz, S.-I. Nishikawa. 1990. The murine mutation osteopetrosis is in the coding region of the macrophage colony stimulating factor gene. Nature 345:442. Cross, M. A., C. M. Heyworth, A. M. Murrell, E. O. Bockamp, T. M. Dexter, A. R. Green. 1994. Expression of lineage restricted transcription factors precedes lineage specific differentiation in a multipotent haemopoietic progenitor cell line. Oncogene 9:3013. Just, U., C. Heberlein, M. Baccarini, J. Friel, W. Ostertag. 1992. Lineage specific receptors are upregulated in myeloid stem cells during differentiation induced by GM-CSF: implications for the hybrid model of differentiation. L. e. a. Sachs, ed. Molecular Biology of Haematopoiesis 155. Intercept, Andover, U.K.
Just, U., J. Friel, C. Heberlein, T. Tamura, M. Baccarini, U. Tessmer, K. Klingler, W. Ostertag. 1993. Upregulation of lineage specific receptors and ligands in multipotential progenitor cells is part of an endogenous program of differentiation. Growth Factors 9:291. Carlesso, N., J. C. Aster, J. Sklar, D. T. Scadden. 1999. Notch1-induced delay of human hematopoietic progenitor cell differentiation is associated with altered cell cycle kinetics. Blood 93:838. Han, W., Q. Ye, M. A. Moore. 2000. A soluble form of human Delta-like-1 inhibits differentiation of hematopoietic progenitor cells. Blood 95:1616. Ohishi, K., B. Varnum-Finney, I. Bernstein. 2002. Delta-1 enhances marrow and thymus repopulating ability of human CD34+CD38− cord blood cells. J. Clin. Invest. 110:1165. Sun, X., S. Artavanis-Tsakonas. 1997. Secreted forms of DELTA and SERRATE define antagonists of Notch signaling in Drosophila. Development 124:3439. Hukriede, N. A., Y. Gu, R. J. Fleming. 1997. A dominant-negative form of Serrate acts as a general antagonist of Notch activation. Development 124:3427. Dorsch, M., G. Zheng, D. Yowe, R. Prakash, Y. Wang, Q. Shen, C. Murphy, X. Xiong, Q. Shi, J.-C. Gutierrez-Ramos, C. Fraser, J.-L. Villeval. 2002. Ectopoic expression of Delta-4 impairs hematopoietic development and leads to lymphoproliferative disease. Blood 100:2046. Jaleco, A., H. Neves, E. Hooijberg, P. Gameiro, N. Clode, M. Haury, D. Henrique, L. Parreira. 2001. Differential effects of Notch ligands Delta-1 and Jagged-1 on human lymphoid differentiation. J. Exp. Med. 194:991. Ellisen, L. W., J. Bird, D. C. West, A. L. Soreng, T. C. Reynolds, S. D. Smith, J. Sklar. 1991. TAN-1, the human homolog of the Drosophila Notch gene, is broken by chromosomal translocations in T lymphoblastic neoplasms. Cell 66:649. Capobianco, A. J., P. Zagouras, C. M. Blaumueller, S. Artavanis-Tsakonas, J. M. Bishop. 1997. Neoplastic transformation by truncated alleles of human NOTCH1/TAN1 and NOTCH2. Mol. Cell. Biol. 17:6265. Pear, W. S., J. C. Aster, M. L. Scott, R. P. Hasserjian, B. Soffer, J. Sklar, D. Baltimore. 1996. Exclusive development of T cell neoplasms in mice transplanted with bone marrow expressing activated Notch alleles. J. Exp. Med. 183:2283. Rohn, J. L., A. S. Lauring, M. L. Linenberger, J. Overbaugh. 1996. Transduction of Notch2 in feline leukemia virus-induced thymic lymphoma. J. Virol. 70:8071. Yan, X. Q., U. Sarmiento, Y. Sun, G. Huang, J. Guo, T. Juan, G. Van, M. Y. Qi, S. Scully, G. Senaldi, et al 2001. A novel Notch ligand, Dll4, induces T-cell leukemia/lymphoma when overexpressed in mice by retroviral-mediated gene transfer. Blood 98:3793. Pui, J. C., D. Allman, L. Xu, S. DeRocco, F. G. Karnell, S. Bakkour, J. Y. Lee, T. Kadesch, R. R. Hardy, J. C. Aster, et al 1999. Notch1 expression in early lymphopoiesis influences B versus T lineage determination. Immunity 11:299. Kawamata, S., C. Du, K. Li, C. Lavau. 2002. Notch1 perturbation of hemopoiesis involves non-cell-autonomous modifications. J. Immunol. 168:1738. Duvic, B., J. Hoffmann, M. Meister, J. Royet. 2002. Notch signaling controls lineage specification during Drosophila larval hematopoiesis. Curr. Biol. 12:1923. Singh, H., R. P. DeKoter, J. C. Walsh. 1999. PU.1, a shared transcriptional regulator of lymphoid and myeloid cell fates. Cold Spring Harb. Symp. Quant. Biol. 64:13. Guerriero, A., P. B. Langmuir, L. M. Spain, E. W. Scott. 2000. PU.1 is required for myeloid-derived but not lymphoid-derived dendritic cells. Blood 95:879.